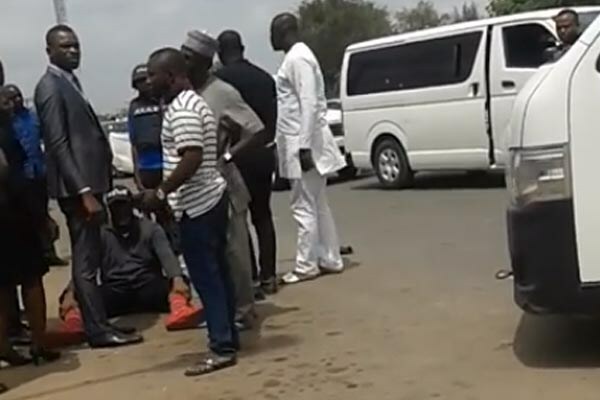 Nigerian senator, Dino Melaye, has explained the events leading to his reported escape from a moving police vehicle that landed him in a hospital in Abuja on Tuesday. A statement signed by his media aide, Gideon Ayodele, on Wednesday morning, said the senator voluntarily submitted himself to the police and, therefore, did not deserve to be forcibly taken to Kogi State to stand trial in a slew of criminal indictments that include murder and armed robbery. The senator also refused to go to Lokoja because he had previously secured a court relief for the case to be moved to Abuja, Mr Ayodele said. The aide said the police have never written to Mr Melaye contrary to their claims in the media. “For the avoidance of doubt, he had never evaded police invitation before now because there was none extended to him in the first place. Rather, what the Police FPRO, Mr. Jimoh Moshood, had been doing was to summon the Senator through media briefings, a practice which is unconventional,” he said. While it wasn’t clear whether or not the police wrote to Mr Melaye as a person, lets talkblog reported last month that the police wrote to Senate President Bukola Saraki requesting for permission to grill Mr Melaye over the criminal cases allegedly linked to him. The police had explained that they wrote to Mr Saraki and the Clerk of the National Assembly for permission to interrogate Mr Melaye after some arrested criminal suspects named the senator their financier and armed supplier. The police accused Mr Melaye of frustrating all attempts to get him in for interrogation, although the senator denied this and all other criminal allegations against him. After some of the suspects escaped from police custody, the police launched a nationwide manhunt and added Mr Melaye amongst the suspects who were at large. The police also said Mr Melaye and other suspects had been placed on the Interpol red alert, but Interpol later distanced itself from the claim and said Mr Melaye would not be placed on its watch list because of the political undertone of his case, lets talkblog exclusively reported. Even though the Interpol declined to place Mr Melaye on its red alert, the Nigerian Immigration Service (NIS) still held the senator at the Nnamdi Azikiwe International Airport while on his way to Morocco on a federal government-sponsored assignment in the morning of April 23. Following the stop, Mr Melaye said he snatched his passport from an official of the NIS who had taken it from him. After waiting at the airport for a while without being arrested, the senator then proceeded to his residence in Maitama District, Abuja. Hours after he arrived at home, police officers stormed his residence and laid a siege that lasted for almost 24 hours before Mr Melaye ultimately submitted himself. Mr Ayodele said family members and political associates of the senator are traumatized by his ordeal. He also said his principal did not jump out of a moving police vehicle as reported in the media based on witnesses’ accounts. But he failed to say how Mr Melaye managed to escape from the police vehicle before he started writhing on the ground as captured in viral videos. The police’s account was that Mr Melaye escaped through the window of their vehicle, but this was readily disputed considering that the senator is over six-feet tall and by every account quite a large individual. Mr Melaye had been at the hospital since yesterday afternoon, although the police said they have re-arrested and planned to take him to Lokoja to stand trial. Although Kogi State Governor Yahaya Bello and Mr Melaye have been in bitter political rivalry in the state, the governor strongly denied involvement in the criminal allegations the police slammed on the senator.